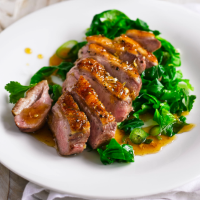 Rich duck breast works best with bold, acidic flavours – like those in this sticky, zesty glaze. 1. Remove the duck from the fridge 20 minutes before cooking. Score the fat in a criss-cross pattern; season. Place, fat-side down, in a frying pan over a medium heat. Cook for 10-12 minutes, until golden and the fat has rendered. Turn over; cook for 5-7 minutes for medium/medium-rare. Set aside to rest under foil. 2. Pour off the fat from the pan, then add the five spice, soy, honey, lemon zest and juice. Boil rapidly for 2-3 minutes, until sticky, then brush over the duck. 3. Meanwhile, in a large pan, warm the sugar with 100ml water until dissolved. Bring to the boil; add the greens, coriander seeds, chilli and coriander stalks. Cover and steam for 2-3 minutes, until just tender. Season and stir in the vinegar and most of the coriander leaves; use the rest as garnish. Slice the duck and serve with the greens, and rice, if liked. This cut has a layer of fat that needs to be rendered. Using a sharp knife, slash the fat in a criss-cross pattern; don’t score the meat. Cook, fat-side down, in a frying pan set over a medium heat until golden and crisp, spooning out the excess fat. Then turn the duck over to finish cooking. Duck should be well-rested before serving. This recipe was first published in Sun Feb 01 12:03:45 GMT 2015.